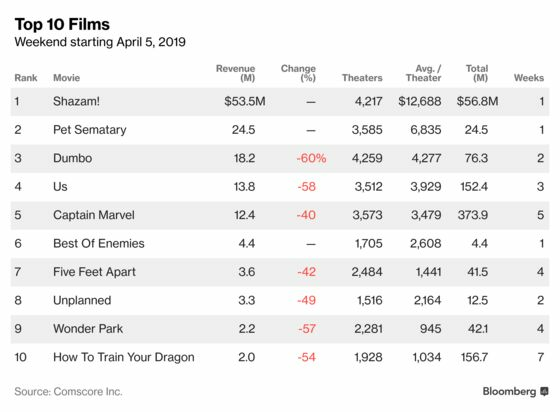 The lighthearted superhero film based on the DC Comics character brought in $53.5 million in U.S. and Canadian theaters, researcher Comscore Inc. said Monday in an email. That compared with estimates of $48 million to $50 million. Paramount’s remake of “Pet Sematary” landed in second place, while STX’s “The Best of Enemies” opened in sixth place. 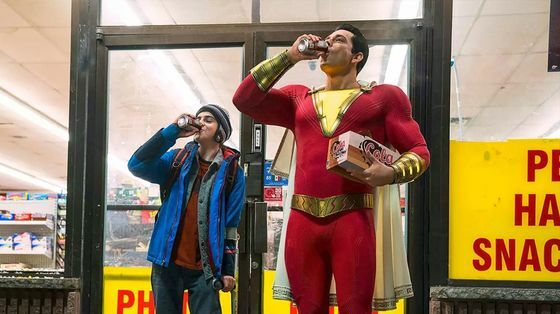 The latest DC Comics film from AT&T Inc.’s film division adds some fun to a Warner franchise that developed a dark reputation with “The Dark Knight” and “Man of Steel.” Reviews for “Shazam!” have been upbeat, with 91 percent of critics recommending the movie, according to Rotten Tomatoes. About a foster kid with super powers, “Shazam!” cost about $100 million to make and millions more to market. Worldwide, the weekend take was $158.6 million. “Pet Sematary” checked in with sales of $24.5 million, missing estimates of about $30 million. About 61 percent of critics recommended the film. “The Best of Enemies” garnered a 52 percent score at Rotten Tomatoes. Analysts were predicting sales of $5 million to $7 million. See the weekend release schedule here.